While walking through the village road to do my project work, I saw 8-10 people sitting in the farm land nearby. These people seemed to be more impoverished than any local resident of the area. However, this was not the first time that I have seen such a scene around my village. On most occasions, I was in the bus and never had the opportunity to talk to these people and know more about them. To satisfy curiosity and know more about them, I asked villagers about these people. These people belong to a caste called ‘Nat’. The word ‘Nat’ is derived from the Hindi word ‘Natak’ which literally means ‘drama’ or ‘play’. While there are number of popular folklores that mentions about ‘Nats’, it was strange that none of the local people talk to these people. People gave a number of reasons like – ‘they have a different language’, ‘they are not indigenous people’, ‘they have really short tempers and tend to fight on trivial issues’, etc. The villagers were concerned about my questioning and warned me about them, before I went to talk to a family (in the picture). People said ‘be careful they have a dog with them, it would be better if you talk to them at least by keeping yourself 5 meters away’. Now being a local person myself, I adhered to the warning and talked to them from a good distance. Nats are professional dancers, acrobats and dramatists who are nomadic (or semi-nomadic) in nature. These people travel from one place to another and have no permanent home. However, the family I met said that they are permanent residents of Chitorgarh and travel here for food for themselves and their animals. Well, they beg. They go from door to door and ask for meals or money. Each family has a certain number of houses in the local area from where they have a tradition to take away some food or money. They have a fixed time to visit the places (after harvesting). Occasionally, they perform dances or acrobatic stunts in the area. According to folklore, decades (or centuries) before, people came to a consensus that the people who belong to the Nat caste will have the job to ‘beg’. Villagers do give them food or money but in general, they don’t talk to them. They let them stay for a few days in their fields but they don’t let them come inside their houses to drink or eat. They carry food, utensils, sleeping mats, donkeys, goats and dogs while travelling from one place to another. As we were talking, I could sense from his stares the he was hoping that I would give him something (money or food) at the end of our conversation. He asked me about the date of the Holi festival. I answered him promptly and asked what is so special on that day? He said, “I and my family need to go to the highway of Gogunda (nearest highway) to stop the cars that pass by and ask for ‘Holi’ (that’s asking for money).” What do they do with the money? Well, according to him, they cook sweet dish that day to celebrate Holi. What is the reality of the ‘Nat’ caste? 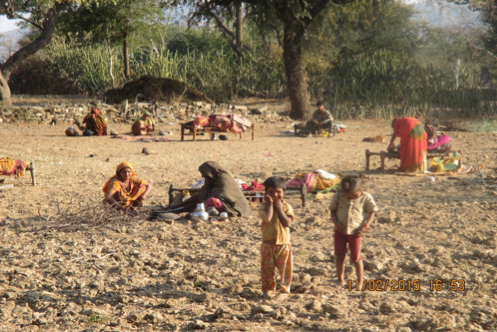 The population of the Nats is less than 0.4% of the total SC population in Rajasthan. They were known to have their origins from the ‘Mewar’ region itself. Some of the Nats are also cattle traders. Majority of them, like Damroo’s family are landless and unskilled professional beggars. Many of them are also engaged in unskilled jobs as laborers. After I finished my conversation with Damroo, he was still looking at my eyes with optimism that I would give him some money or food. I wasn’t sure if I should give him some money. Therefore, I started walking away saying ‘thank you’ for taking his time for the conversation. But he stopped me and asked for money. I generously gave him a note and his happiness and exhilaration at receiving that tiny amount was huge and was worth taking a snap. Unfortunately, I was unable to do that. great work.. I am interested in this work. I have done and P.G in human Rights. I am working in ruler area. like Rajasthan,up, mp etc…..